In another hard hitting letter, former Revenue Secretary EAS Sarma has drawn attention to an investment by M/S Lakeside Investment Ltd., which may be an affiliate of the Ramalinga Raju family of Satyam Computers in the Gangavaram Port at Vizag. The detailed letter, pasted below is addressed to the Prime Minister Dr.Manmohan Singh and also marked to the Revenue Secretary and SEBI Chairman. It outlines in detail the reasons for Mr. Sarma's suspicions about dubious money being re-routed into the project through overseas tax havens. Will the government now wake up to the malaise of round-tripping of unaccounted funds into India and rampant tax evasion involved? Ironically, even before a serious investigation into how money has been siphoned out of India, the government is promising a line of credit to Satyam Computers. Will this be the beginning of large chunks of taxpayers’ money going into extravagant and recklessly conceived private sector projects in India? After retirement, I have settled down in Visakhapatnam. I have instituted a citizens' body, Forum for Better Visakha (FBV), to discuss and debate public policy issues and pressurize the government agencies into delivering good governance. In particular, our Forum has been questioning the dubious land deals of the State government and articulating our concern for safeguarding the interests of the voiceless people who are displaced as a result of such deals. As a part of this ongoing citizens’ struggle for probity in public life and social justice, I have been trying to find links between some of these land deals and their wider impact on the economy. Ever since the startling disclosures made by New York Herald Tribune on 26-2-08 on evasion of tax by foreigners (including Indians) in Germany by using the Liechtenstein bank route, I was trying to find out whether the Indian tax authorities had tried to take advantage of the generous offer made by the German authorities to help different governments in tracing tax evaders in their respective countries. In order to procure this information, I had to resort to filing applications under the RTI Act, 2005. So much for the so called “transparency” of your government! I have a specific lead in this connection on the now infamous Satyam Computers case in which the company’s shareholders have been blatantly defrauded by its promoters. Incidentally, the Satyam case, in my view, represents only the tip of the iceberg and it has wider implications. The lead comes from Gangavaram Port project which has been in the eye of a storm in the recent years. To an uninformed observer, it appears reasonable that the setting up of a port would necessarily deprive the local fishermen of their rightful access to the sea. A more discerning observer would readily appreciate that the State government should have come up with a satisfactory relief package that addressed the fishermen's concerns in a forthright manner, by providing an alternate and acceptable location near the coast. In reality, this has not happened. Fishermen were forcibly evicted. When they resisted, the police deployed force that resulted in the loss of an innocent life. I had written to you about this unfortunate incident on 27-3-2006, seeking your intervention. For some reason, you did not respond. However, this case prompted me into investigating Gangavaram port affairs a little deeper. On an RTI application filed by me before the State Govt. on 28-5-2006 on the shareholding pattern and other details of the private Gangavaram port in A.P., after a great deal of procrastination and, on being repeatedly prompted by the State Information Commission, the State Government finally informed me on 25-8-2007 that around 18% of the equity of Gangavaram Port company was held by Lakeside Investments Ltd., a Mauritius based company. Apparently, this company is a smokescreen for tax evasion. For some strange reason, the State government was hesitant to part with this information that should have been placed in the public domain in the normal course. On hearing about the case of tax evasion by Indians through the Liechtenstein route, I filed my first RTI application to CBDT on 29-7-08 enquiring about the progress of collection of information from the German authorities. CBDT’s reply was not quite helpful. They informed me that they had some (not-so-convincing) difficulty in obtaining the required information from the Germans. With a view to pursue the lead further, I filed another application dated 10-9-08 under RTI Act asking CBDT to provide information on many aspects of tax evasion through the known tax havens like Mauritius. In particular, I had enquired about a few specific cases. In particular, I reproduce here the question I had posed on Lakeside Investments Ltd., the investor in Gangavaram Port company and the reply I received from CBDT on 15-10-2008. My Question: Have you investigated any cases of possible tax evasion in foreign investment flowing into India from Mauritius and Cayman Islands? There are specific cases of major projects such as SEZs, IT projects, more specifically a project like Gangavaram Port near Visakhapatnam in which investments through Mauritius-based agencies (M/S Lakeside Investment Ltd. in the case of Gangavaram Port) have been made. Have such cases been investigated successfully/ unsuccessfully? My RTI application was addressed to CBDT and it is strange that I should receive a non-reply of this kind. Irrespective of this, I expected a responsible government agency like CBDT to follow up on this lead to trace the investors who have evidently used the Mauritius route to stash away their money and recycle it into the government's much touted infrastructure projects. Today's Deccan Chronicle (local edition) reports that Ramalinga Raju's undisclosed wealth went into this very same company viz. Lakeside Investments Ltd.! I am not certain whether it is true. The economic offences wing of the Finance Ministry should have more details. If this information is true, there could be many tax evaders, including some political bigwigs who have similarly parked their funds in tax havens like Mauritius, Cayman Islands, Lichtenstein Bank etc. The scheme of investigations carried out by your Revenue authorities into such cases leaves much to be desired. While the Satyam case has indeed attracted a nationwide debate, a wider investigation needs to be carried out by CBDT, CBI, Ministry of Corporate Affairs, SEBI and others in a coordinated manner to examine the large-scale fraud that is going on in the name of SEZs, private ports, merchant power projects, airports and what not. Satyam and Maytas represent only the tip of the iceberg. There is perhaps large-scale cross-border money laundering that needs to be traced and the culprits brought to book. Behind the sheen of the so-called corporate successes, a comprehensive investigation may reveal infringement of many statutes and regulations, such as, the company law, the tax laws, the SEBI regulations, the FEMA and money laundering laws, land-use restrictions, environment protection laws etc. The governments in general seem to have been caught in an unprecedented rush to push through projects without subjecting them to due diligence. While such an approach may project the economy in the short-run to be doing well, it will surely spell disaster in the long run. More than anyone else, as an economist, you are aware of the far reaching implications of a black economy that seems to pervade our system widely. Mr. Prime Minister, before I conclude, may I point out here that many countries have already moved fast on the information provided by the Germans and even prosecuted and punished the tax evaders, whereas the Indian authorities are still dragging their feet. The Enron culprits were brought to book within a year or so but the culprits of our own domestic Enrons like Global Trust Bank continue to remain in cosy comfort. If you want to project India as a safe destination, you need to show to the rest of the world that we respect our own laws and we respect ourselves! Dr. Madhav Godbole and I have suggested civil services reform and my letter is languishing in the South Block. The Hon’ble Supreme Court has ordered far reaching police reforms on which the States are dithering. There are other areas that call for similar review and reform. India's strength will surely depend on such positive changes. It is in the public interest to push through these governance reforms. I am confident that you will move the various agencies into action on the leads I have provided you here. I am equally confident that you will do something tangible to energise and invigorate our otherwise passive regulatory authorities so as to make them more proactive and effective. On cross checking, Deccan Chronicle mentioned the name of Lake View Investments. Gangavaram port has "Lakeside Investments". I suspect that there is some link, as Gangavaram seems to have had earlier links with Satyam through its top managers. Government should investigate both these companies. It could reveal how funds are recycled and projects are financed! The Gangavaram Port authorities have since written to this website to say they have no connection with Satyam. 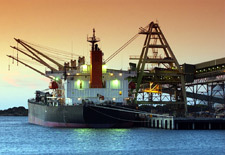 A letter from port has been published under the feedback section of this website. The port authorities also met Dr.EAS Sarma. We publish below the letter he has written to Chairman DVS Raju, Chairman, Gangavaram Port. Please refer to the meeting we had at my residence a few days ago when I clarified to you about the confusion that arose between the names of the two companies "Lakeside Investments" and "Lakeview Investments" and the reasons for such confusion. I had also informed you that I could notice the error on the same day on which I addressed the letter to the PM. On that very same day, I apprised him of this factual error and also informed the others (including Ms. Sucheta Dalal) to whom I had sent copies of my original letter. Subsequently, one Pranav Choudhary, CFO of Gangavaram Port, perhaps at your instance, had written a letter to Ms. Sucheta Dalal, clarifying the position. He also added the following observation. "One cannot make an allegation and moreover write letters to Prime Minister just on the ground that "Lakeside" name sounds similar to "Lakeview"." Since Pranav Choudhary has made this oblique observation referring to my letter, I wish to set the record straight by making the following position clear. Whether one of the shareholders of Gangavaram Port is "Lakeview Investment" or "Lakeside Investment", I would still have written that letter to the Prime Minister and the other concerned agencies for a proper investigation for several compelling reasons. I feel that a proper investigation of Lakeside Investments is necessary for the government to satisfy itself that there are no irregularities about the source of funds for the company, in so far as the Indian laws are concerned. Apart from the striking similarity between the names of the two companies, both the companies are Mauritius-based. If one Mauritius-based company has come under the scanner, it is but natural that there is apprehension about other similar companies. My correspondence on Gangavaram Port and Lakeside Investment did not start with my letter to the PM this month. If you had read that letter, you would have appreciated the larger thrust of my appeal to the government. Both you and the state government are fully aware of the long and tortuous history of how my simple request for information on the names of the shareholders of Gangavaram Port had been dealt with. In fact, I had made a brief reference to this in my letter to the PM. Gangavaram Port is not just a private port. It is a joint venture between the State Govt. and the promoters. But for the undervaluation of the land given to the port by the government, government's equity share in the company would have been even higher. Further, the manner in which the strategic investor in the port company changed more than once, from the time the bid was finalized, till date, also gave rise to concerns in the in the public mind. It is a company in which the public is an important stakeholder, apart from the fact that the port has resulted in the forcible displacement of a number of fishing households. The public is concerned about the incomplete and inadequate rehabilitation of the fishermen. It is but natural that the public should take interest in what is happening with the port and its corporate profile. In a joint venture company such as this, the least that the government and the promoters could have done was to divulge the names of the other equity partners on their own, without the public demanding for the information. Unfortunately, neither the government nor the promoters had done this. As a concerned citizen, I had to ask for the information under the RTI Act as early as in 2006. The government, for some strange reason, stonewalled my request for about one and a half years on one pretext or the other, especially invoking the reason of "confidentiality", even though neither the MOU between the government and the promoters nor the RTI Act provided such protection. I am not sure whether the state government adopted this stance in consultation with the port authorities themselves. Finally, I had to approach the highest statutory authority under the RTI Act viz. the State Information Commission to direct the State Govt. to provide me the information. Only when that authority had issued such a directive, the state government reluctantly obliged. That is how this precious and "confidential" information about "Lakeside Investment" came out into the public domain. If a citizen like me has doubts about the source of funds flowing into Gangavaram Port through Lakeside Investments, I suppose there cannot be any better justification than this background. The fact that the scam funds from Satyam were reported to have been remitted into a Mauritius-based company has certainly given enough reason to citizens like me to entertain apprehensions about similar Mauritius-based investment companies having dealings with Indian companies. The question here is about the source of funds for the Mauritius-based company, not who owned it. While Mauritius-based companies may comply with the conditions of the tax agreement between India and Mauritius, funds clandestinely flowing into such companies from India outside the legally recognized channels should still be viewed illegitimate, as they violate the other laws. Perhaps, this is not the case with Lakeside Investment. Only a proper investigation will establish this. I appreciated the clarification given by you in person (when you had called on me) that Lakeside Investment is a wholly owned subsidiary of Warburg Group. At that time, my response to this was that Gangavaram Port's website did not disclose this important fact. In fact, your company did not come out openly on this till they happened to see my letter to the PM. The press note issued recently in response to my letter to the PM has been the only disclosure on this! When you met me, I had suggested that the name of the company i.e. Lakeside Investments Ltd., the name of its parent company viz. Warburg Group and the names of the directors of Lakeside Investments Ltd., should be disclosed on the website of Gangavaram Port as a measure of good corporate governance to which you yourself had expressed firm commitment. Till today, no such disclosure is forthcoming. It will also go a long way towards promoting transparency in the functioning of your company if Warburg Group comes forward and discloses the source of funds for Lakeside Investments Ltd., as you yourself had apprised me of the credibility and reputation that Warburg Group enjoys in the global financial world. I am sure that Warburg Group will have no hesitation whatsoever in divulging these details, unless that company has some hesitation for its own reason. Whether it is Gangavaram Port Ltd. or it is the Warburg Group, it should be remembered that you are dealing with the law of the land and you are in joint venture with a sovereign government. If you are not transparent, the citizens have every right to entertain apprehensions. That is the reason why citizens like me will continue to ask questions till transparency in disclosure is ensured.. I am sure you, more than any one else, will appreciate the spirit underlying this letter and do the needful.